Stand alone or series: Book 3 in the Broken Earth series. Reviews of Book 1 and Book 2. Warning: I tried to be as spoiler-free as possible for this last book but a few spoilers for previous books. So here you are, at the end of a series you love, reading about the people you came to care about and about a magical world that is wholly different from yours but also incredibly familiar. I kept thinking of that saying about “comforting the afflicted and afflicting the comfortable” as I read The Stone Sky. There are endings that come as revelations, works that foment thought, books that provoke discomfort at the same time that they offer relief and hope. If you are thinking how is it possible that one book can do all those things, I don’t know, but that’s exactly what N.K. 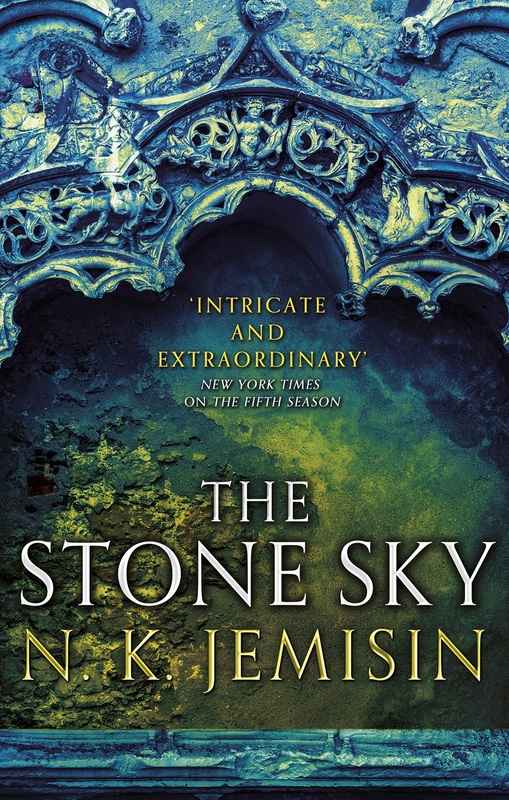 Jemisin did with The Stone Sky and ultimately, with The Broken Earth series. By any measure, these books are dark, discomfiting and sad but underlining it all, there is a measure of uplifting hope through unity and revolution. Smile through tears, if you will. Here at the end of it all, a mother and a daughter finally meet again. One hoping to save everything, the other wanting to destroy it all. Ironically, both Essun and Nassun are motivated by loss, by a deeply felt sense of injustice. They are both relentlessly angry and prepared to use their tremendous power to make things right. Even if they have to shatter their whole world. The vast majority of the book takes place on the road, as the two make their way toward their destiny, to the missing Moon – and to each other. They do not travel alone though. On Nassun’s side, a found family, a community to take care of as well as to care about. The stone eater Hoa is one of them – a greater presence with every subsequence book in the series, Hoa’s importance increases twofold here at the end of all things. With Essun, her father figure, the Guardian-turned-not-Guardian Schaffa and another stone eater Steel, someone with his own agenda, a warped reflection of Hoa’s. In this last book, we learn that this is a story 40,000 years in the making. A story, a history of repeated wrongs. It interrogates history, memory and the way that it is often possible to forget details and facts when history becomes mystery. But sometimes even through mystery, systems of oppression are maintained through generations. This is the core of this story which includes revenge and reparations but above all, the ABSOLUTE certainty that systems of oppression need to be destroyed, mercilessly. Its earth-shattering ending is punctuated by this as well as by an amount of hope and love that would be at odds with the story if it wasn’t its whole point. It’s also interesting how magic permeates this book more than the others in the series – it’s unquestionable a huge part of it now, it has always been, of course. Just like the hidden feature of Father Earth has been there all along. Meanwhile, the second person narrative once again turns into something else: there is a larger purpose to it. A purpose that is at once heartbreaking and heartwarming, just like everything else in this story. With the added viewpoint narrative of Hoa and his own story, the most striking thing is the cyclical nature of it all – not only of the seasons but when learning of Hoa’s story and how it almost mirrors Essun’s in its arc. I loved that juxtaposing just as l loved how it all ended. So here you are, at the end of a series you love and that’s when you realise, The Broken Earth is about you. It’s about us. So, yes. It was more than worth it: it’s a Shattering all on its own. And sometimes that is a good thing. Rating: 10 – Perfect and a 10 to the series as a whole and obviously a top 10 of 2017. Duh.